Although the wombat's legs are very short, they are ideally equipped, not only for carrying the heavy body but also for digging. The feet are plantigrade ('sole-walking'): the animal walks with the entire sole of its foot on the ground. This is a characteristic of animals that mostly walk and seldom run, whereas the runners, such as the carnivores, walk on the ball of the foot and have digitigrade ('finger-walking') feet. 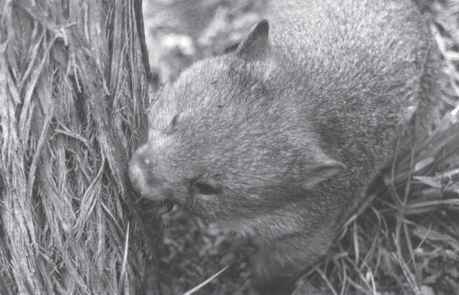 The wombat's front feet are broad and have five toes with long strong claws, blunted at the tips by digging. Figure 2.4 The broad front foot with five strong claws (left) and the hind foot (right). The inner toe of the hind foot is a clawless nub, but the other toes have long claws. Illustrations: © Jonathan Guy third toes of the hind foot are fused together, as in all other diprotodont marsupials, but this join is not as obvious in the living animal as it is, for instance, in a possum, koala or kangaroo (Figure 2.4). The soles of both the front and hind feet have fleshy pads, covered in tough, leathery skin which becomes roughened with age and wear. When a wombat first emerges from the pouch this skin is pink and soft, but it soon becomes black and leathery.